Possible line-ups: Northampton (4-4-2): Cornell; Goode, Taylor, Pierre, Buchanan; Hoskins, Foley, Turnbull, Bridge; Morias, Williams. Mansfield (3-5-2): Logan; Preston, Pearce, Sweeney; Jones, MacDonald, Bishop, Tomlinson, benning; Walker, Hamilton. Man in the middle: Paul Marsden – Handed out a spate of red cards in recent weeks, sending off eight players in his last 14 games. Refereed Northampton twice this season, the 0-0 draw with Notts County and the 2-1 victory at Tranmere Rovers. Opposition view: “We are resilient and we have warriors and an incredible energy in the team,” said Stags boss David Flitcroft this week. “We have to combat whatever style of team we come up against. Our team is equipped to do that. James Heneghan’s preview: If the Cobblers are intent on launching a promotion challenge of their own next season, then this weekend’s encounter with second-placed Mansfield Town will give them an indication as to how much progress they must make. Four games without a win mean Town are firmly embedded in mid-table heading into their final five fixtures but eyes are already turning towards the summer and then next season when a push towards the top seven will be expected. It was against Northampton when Mansfield’s season belatedly sprung into life. Just two wins from their opening nine league games had left them 16th in League Two and doubts were growing over manager David Flitcroft, who left Swindon for Field Mill at the end of last season. But Timi Elsnik’s fifth-minute opener set the Stags on their way to a resounding 4-0 win over the Cobblers and from there they didn’t look back, not losing any of their following 19 matches to leap all the way up to third by the end of 2018. After a brief wobble in March, when they lost to Crewe and Port Vale and drew with Crawley, consecutive wins over Exeter and Cambridge have them on track ahead of Saturday’s trip to the PTS, though given four points separate four teams in the race for two automatic promotion spots behind champions-elect Lincoln City, the pressure very much remains on. Mansfield’s promotion challenge has been built on an impressively resilient defence – no team in the division has conceded fewer than their 34 goals this season, three less than leaders Lincoln and eight less than next-best Forest Green. But away from home they are not quite so formidable. While 44 of their 72 points have come at Field Mill, only 28 – the seventh best in League Two – have come on the road, winning one of their last six away from home, albeit that sole victory coming in thumping fashion at promotion rivals Exeter City two weeks ago. 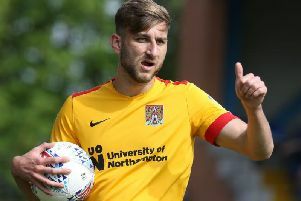 The Cobblers have close to a full-fit squad to pick from. Only George Cox, who is finally back in training after a long-standing ankle problem, and Shaun McWilliams, still struggling with his hamstring, are doubts for tomorrow. On the face of it, Town have little on the line for this game. But with Curle up against another one of his former clubs, and a sold-out away following expected, he’ll be intent on spoiling the party.